David Cox spent five years as a jackeroo on outback sheep and cattle stations before he became an author and illustrator. 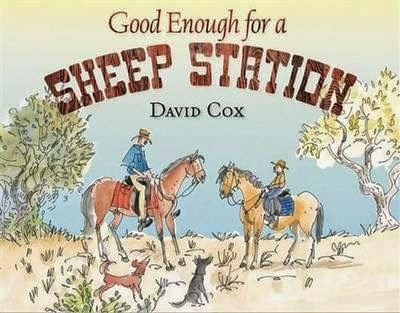 Set in 1940s, the story follows a young boy’s upbringing on a Queensland sheep station. It shows its outback characters and understated humour as told in various anecdotes. The story is full of quirky details from how the boy completes his schoolwork via correspondence to learning stockman’s skills from his dad and learning to drive a truck from a young age. This picture book documents a way of life that may be unrecognizable to many modern children raised in the city, but the story goes deeper than that; it tells of loss and handing down tradition but also, as David Cox writes in the foreword, it is a story about many kinds of love. Cox’s fluid watercolour and ink illustrations create a colourful bush world. Dogs run in and out of the pictures as they would in real paddocks and the horses outnumber the sheep. The longer word count makes it a picture book for primary school aged children.